How are Australian school libraries doing? Softlink have released the results of their survey into the state of school libraries in Australia, the survey has been conducted for the second year in a row making it possible to make good comparisons. You can read the report or download it. There is a significant positive relationship between a school’s NAPLAN reading literacy score, the school library’s budget and staff allocated to the library. The difference in funding and literacy outcomes can be quantified. In general, low performing schools allocate 30% less to the school library budget than average schools. Higher performing schools allocate twice as much to the school library budget as average schools. Sent to me by one of our staff. This is fascinating. Fascinating because of the sheer massiveness of the numbers, the rising (and falling) stats, and the projections for our future use of all the various online tools. The mobile devices usage projections are really amazing I thought. If you go to the site you can get the infographic in image form. Check out the Get Reading website. This is an Australian Initiative and has just the most lovely website. 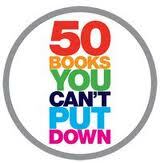 Browse through their book of the 50 Books you can’t put down Turn up your sound so that you can hear the pages turning. Download the Pdf files, and enjoy the sheer loveliness of this well designed book site. You could spend quite a lot of time on here. This year it runs from 24 August to 30 September. Well supported by the Australian government this initiative is similar to what we have here as Bookmonth, but of course they have so much more funding and Australia is a much bigger country I suppose, therefore I allow their site to be so very slick in comparison to ours. There is a You Tube Channel and you can find it here. Lots of Ozzie literary, celebrity and sporty types talking about what is going on, and speaking about reading. The Guardian Children’s website has some absolute gems on it, certainly worth a regular check. 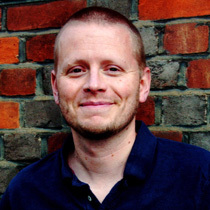 But on Friday the link to the MP3 recording of Patrick Ness’s speech to the occasion of Julia Donaldson (Gruffalo) being awarded the Children’s lauriate for 2011 was posted on the Australian Listserve. I’m a fan of listening to great speeches while covering books or doing one of the really mundane jobs in the library. This was certainly a rewarding thing to do. The link is here. But if you aren’t an MP3 kind of person you can read here the edited version of his speech. Anyway, Patrick is a bit annoyed and that is putting it mildly, with the attitude of folks in local government and schools who cull their library staff . He is peeved at the fact that in England (and it isn’t just there) libraries and librarians are being cut and closed. His speech is so great! He speaks as a reader, a writer and as an avid library user for all his life. He passionately advocates for librarians both public and school, and he talks about having great conversations with librarians about books and reading. Patrick Ness is such a wonderful writer, boys at my school love the books once they get used to the unusual style. Even those who resist my insistence that they will love it are being drawn into the books as they are encouraged by their friends to read them. Read or listen to the speech and you will see his passion and you will cheer for him and for libraries! The difference 1 minute makes! This graphic really is amazing. This is what happens in the eWorld every minute. 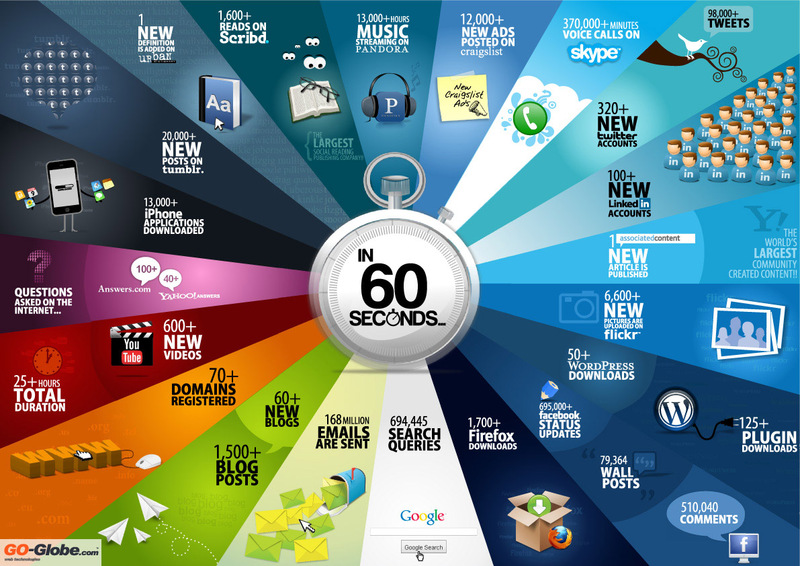 98,000 tweets, 6,600 new photos uploaded to Flickr, 600+ new videos, 168 million emails. I wonder how different this picture is from last year! I guess we can all guess how different this was 5 years ago. Given that I am the co-owner of one blog (this one) and the sole owner of 3 other ones I find the stat of 60+ new blogs started every minute and 1,500+ blog posts ever minute one of the most interesting stats on here. Tonight I plan to post to this one and my personal one, so I am definitely contributing to these stats. I guess also if there are that many people like me posting to and starting blogs someone else out there must be reading them. I’d love to hear about peoples favourite blogs. Who do you follow and why do you follow them? Etiquette is just so important don’t you think? Good manners in the library are what we expect from our students, and of course we always have students in our libraries who understand the finer points of etiquette don’t we? If, however, you are struggling with your own manners librarywise you might find the following blog very helpful. A Librarian’s Guide to Etiquette is perfect for the librarian struggling with manners. The blog is funny, but the comments which go with the posts are hilarious too, click on the post titles to bring up the comments in the right format. Particular favourites of mine are: Chairs, Pushing in, and Glamorous, being. This blog has just been awarded one of the really big prizes in the blogging world The Salem Press Library Blog Award. It won for quirky library blog – you’ll see why!